Product prices and availability are accurate as of 2019-04-02 22:00:45 EDT and are subject to change. Any price and availability information displayed on http://www.amazon.com/ at the time of purchase will apply to the purchase of this product. Step out with the simple yet stylish Calvin Klein® Minimal Watch - K3M2112Z. Stainless steel case. Stainless steel bracelet with a clasp release. Round face. Three-hand analog display with quartz movement. Dial features silver-tone hands and Calvin Klein detailing. Mineral crystal bezel. Water resistant to 30 meters. Display case included. Imported. Measurements: Case Height: 40 mm Case Width: 40 mm Case Depth: 6 mm Band Width: 19 mm Band Circumference/Length: 10 in Weight: 2.6 oz This product may have a manufacturer's warranty. Please visit the manufacturer's website or contact us at warranty@support.zappos.com for full manufacturer warranty details. 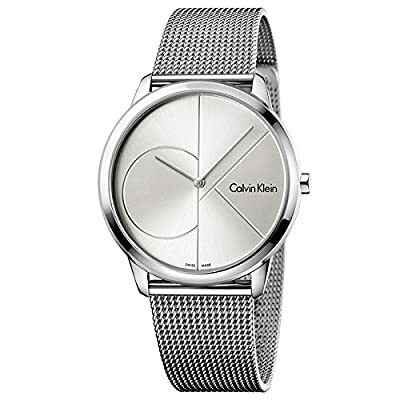 Step out with the simple yet stylish Calvin Klein® Minimal Watch - K3M2112Z.